OFWs and other expats have a reason to rejoice, for finally, their passport will be given to them, as LABOR MINISTRY of SAUDI ARABIA warned employers to return non-Saudi passport within one month or face penalties. The government of Saudi Arabia through the Ministry of Labour and Social Development has reportedly given employers one month to return passports to their employees. In a report by the Saudi Gazette, the country’s Council of Ministers first banned employers from keeping passports severals years ago. The KSA Ministry of Labor will also penalized employees with a fine of SAR2,000 if they keep their employees passport or fail to return them. Accordingly, reports says that the Labor Ministry and Social Development is giving EMPLOYERS ONE MONTH deadline to return the passports of their employees. Previous posts about this generated a lot of comments that their employers are still keeping their passports and do not follow the Labor Ministry order. 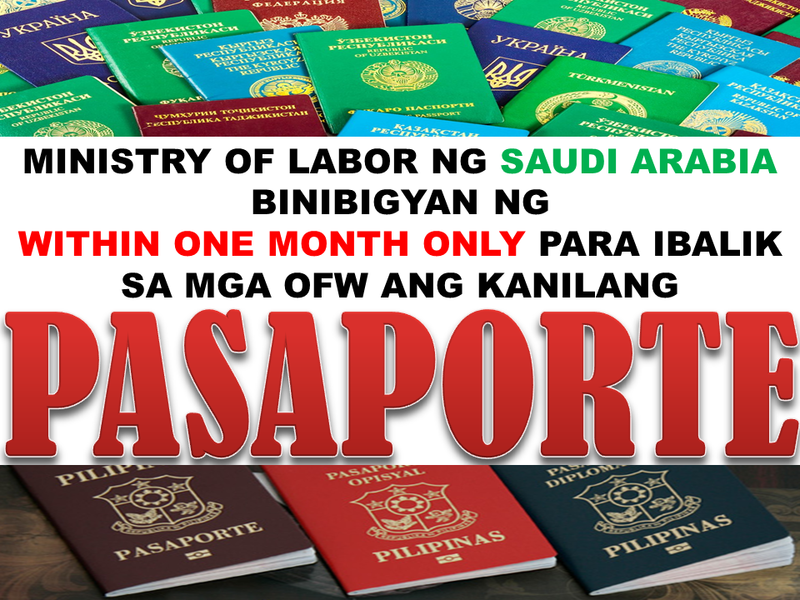 This is good news to many Filipinos, OFWs based in Saudi Arabia especially those working as household service workers.Some employers are keeping their passport so they cannot escape from maltreatment and abused. Some are simply keeping their passport so they will be hold hostage, especially if employers are not following rules and regulations agreed especially when it comes to salary, day-off and unfit labor practices. Quoting the Secretary General of National Society for Human Rights Khalid Al-Fakhiri said that holding an employee’s passport is a form of human trafficking. “What binds the employer and the employee is the contract. The passport is a personal document. No one has the right to take it because it becomes a crime of abuse and denial of rights,” as reported in Saudi Gazette.